In this shot my grandson learns to clean the first fish he ever caught! His is the smaller hand holding the tail fin. The larger hands are those of our neighbour on the lake who took B. out for his first fishing trip. The boat was pulling away from the dock when B. snagged this fish about 10 feet out – a large northern pike. He had never worked a rod and reel before and everyone thought he’d caught a rock or old log at the bottom of the lake! It was the only catch of the day! 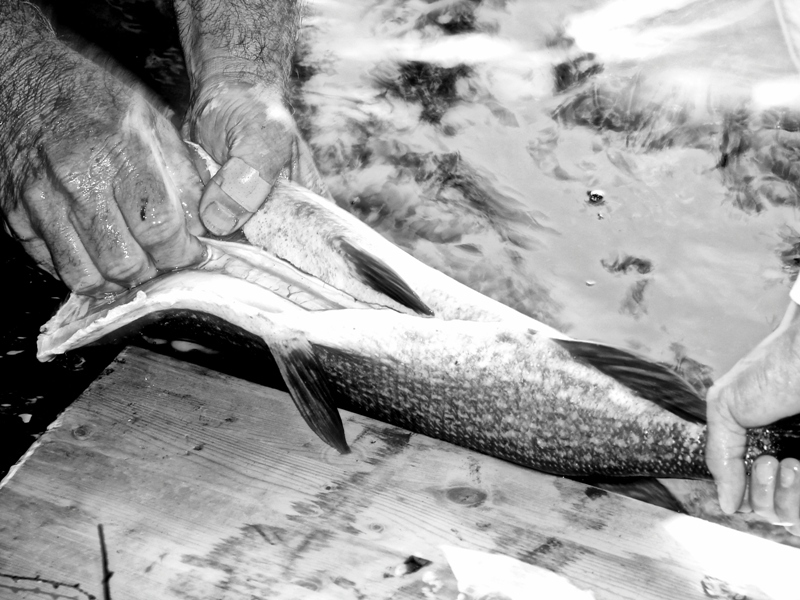 Tradition also holds that you have to cook and eat your first catch … pike are riddled with bones, but everyone dug in. Beautiful entry! And what a wonderful story! Thank you Madhu. It hardly compares with your interpretation of giving and being given. Thanks for stopping by … and for the ping! There’s a saying, “You teach a man how to fish, he’ll know how to feed himself for the rest of his life.” A beautiful photo with a life changing lesson to teach all of us. Your grandson is lucky to have you guys in his life…thanks. Thank you Mr. B. We’re pretty lucky to have him in our lives too. He loves nature and the outdoors as much as we do. Thanks for the ping, Ben … and for stopping by to have a look at my blog. Thanks for the ping. Loved your “China Hands” series, particularly the hands making jade. Thanks. It was a colour shot, converted to B&W, and then minimal digital processing to enhance the textures (the old hands), contrast and tone of the shot. Thanks for stopping by to have a look at my blog – and for the ping! That is such a wonderful textured photo. The contrast of young hand and old hand, the inside and outside of the fish, the grain of the wood table against the blurry background all make this a photo to really dig into. And the story is a wonderful addition. I still remember the first fish I caught at age three – a bream, caught with a plastic Micky Mouse rod and reel. Everyone was surprised that my toy gear landed a fish. Like your grandson, I got to help clean and cook, and then eat my first catch. I like it that the ‘eat the first catch” tradition continues. I was a lot older than three when I caught my first fish! Thanks for the feedback, Janet. Love the Heart Hands! Thanks for the ping. Thanks for the ping … lovely butterfly! Love your interpretation “Don’t doze off” Thanks for the ping. Thanks for the ping … love your multi-coloured interpretation of this week’s challenge! The first fish ever caught is a great memory. Mine too. My uncle took me out in his boat onto a lake so clear I thought the dead trees at the bottom were reaching up to grab us. Rock bass are a lot of fun for a kid to catch … nothing so serious as a Northern Perch!! And thank for the ping.